Café Racer magazine (France) hosts its annual Café Racer Festival at the Montlhéry autodrome on the third weekend of June, and it remains the sole motorcycle-only event held at that historic track. Other events like Vintage Revival Monthléry are mixed car and bike, so the CRF is something special [but watch our film on Montlhéry here!]. This year the event was made extra-special by the efforts of French moto-journalist and historian Francois-Marie Dumas (a Vintagent Contributor), who organized an exhibition of simply remarkable machines with racing and record-breaking history at or near the track. 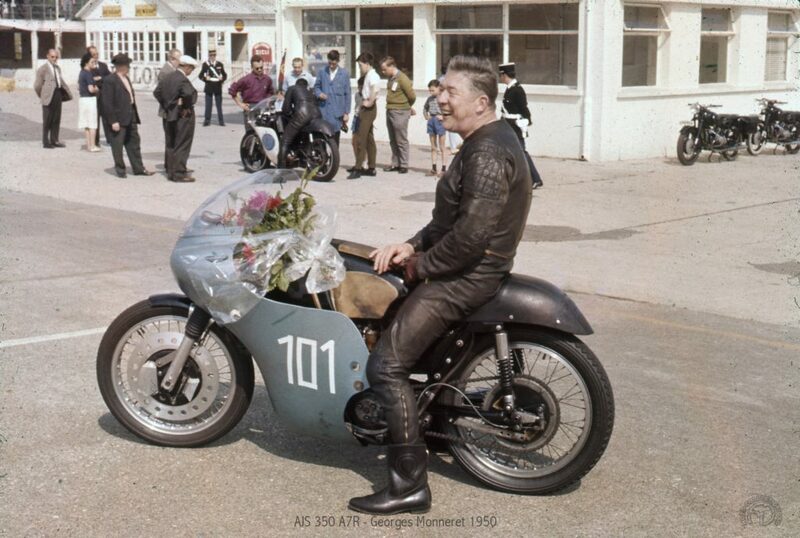 Francois-Marie kindly provided us with photos from the Café Racer event, plus historic photos of these motorcycles racing and taking records at Montlhéry and nearby Arpajon in their day. Considered to be one of the most beautiful of all French racing bikes, only 13 units of the 1,000cc Koehler Escoffier were built between 1927 and 1935, and this special model developed for the great Georges Monneret is unique. The first version of the K-E OHC V-twin appeared in 1927, and developed 35 hp @5,500rpm, with such a power/weight ratio that the rear tire had to be glued onto the rim with lacquer, to prevent it from spinning at startup! This imposing engine used the most advanced techniques of its time, with two simple overhead camshafts driven by shafts, using hairpin springs in the open air, and a separate 4-speed gearbox box housed in a simple rigid frame, without rear suspension. 78hp and 200kmh without rear suspension! Remodeled for 1935, the K-E 1000 ‘officially’ gained another 10hp, but it’s said the special Monneret version developed 78 hp running on alcohol! After the parenthesis of WW2, Georges Monneret, with 8 French championship titles (6 of which were acquired on K-E) roared back in 1947 for new records and, in 1952, his son Pierre improved one last time on his father’s Montlhéry records. 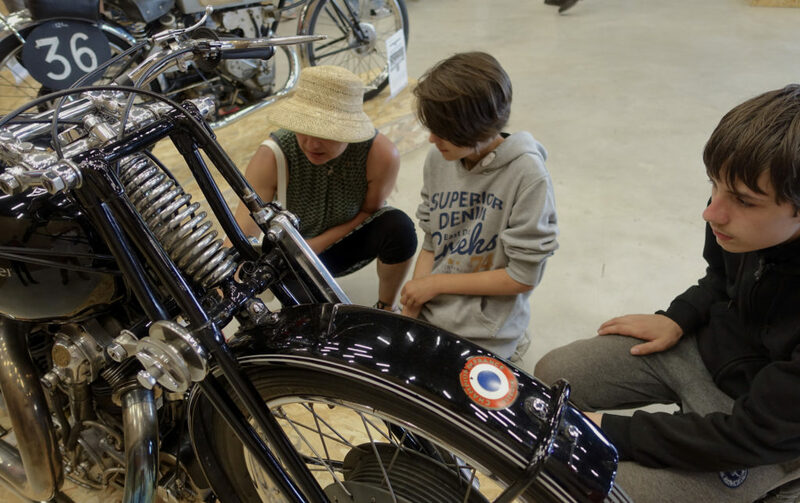 This was the ultimate feat of the 1000 Koehler Escoffier, which, after 1/4 of a century, deserves its place of honor at the Henri Malartre Museum in Lyon, but the magnificent beast comes out regularly for demonstrations of old motorcycles. 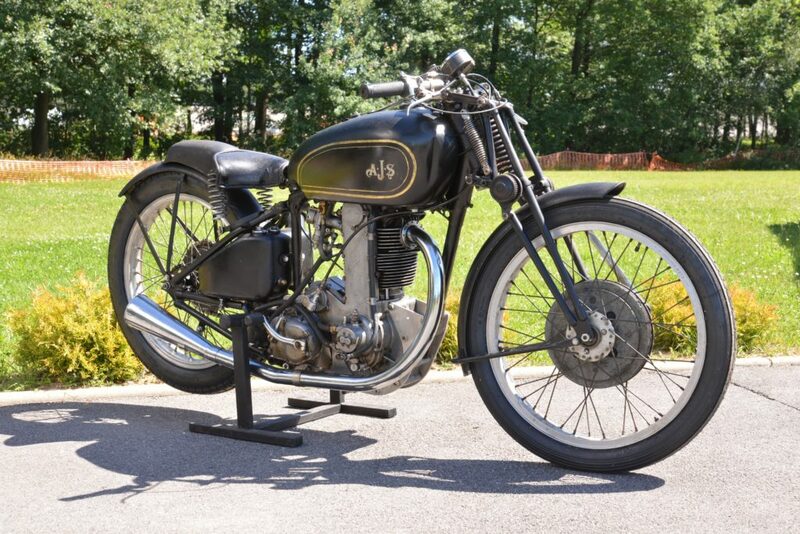 AJS has the equal of Norton for the longevity of its single-cylinder, chain-driven OHC production racers. Both the AJS 7R/Matchless G50 and the Norton Manx have their roots in late-1920s designs that were continually developed through the 1950s, until their respective racing departments were shut in 1962. Both designs have also been in near-continuous production post-factory, as replicas are built even today to support demand for vintage racing and spares. The AJS chain-driven overhead camshaft racer first appeared in the 1927 Isle of Man TT, and its simple design was made possible by the invention (and licensing) of the Weller chain tensioner (a sprung steel blade bowed against the chain run), making long chain runs possible without case-grinding chain whip. 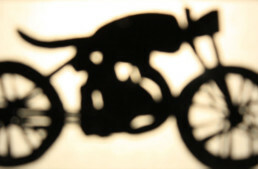 In 1929, the AJS team took their R7 (350cc) model to Montlhéry, gaining 117 world records(! ), including a 2-hour stint at 160 kmh/96mph [it’s interesting to note AJS/Matchless milked for publicity a 1 hour @100mph run at MIRA with a 650cc G12 in 1963 – progress?]. 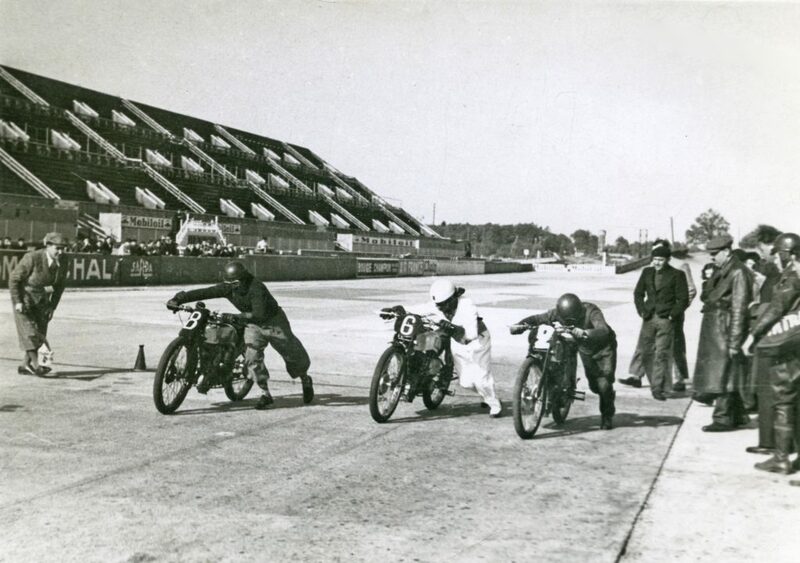 AJS continued to shine at Montlhéry in 1930, settting 5 new records in the 350 and 500cc classes. The ultimate factory racers of the 30s, like the one exhibited, prefigure the post-war AJS 7R ‘Boy Racer’ by using an aluminum cylinder and head, magnesium crankcases, a reinforced crankshaft, and a Burman gearbox specially made for AJS. This 1937 version is the last of the rigid frame machines, as they gained rear suspension in 1938. 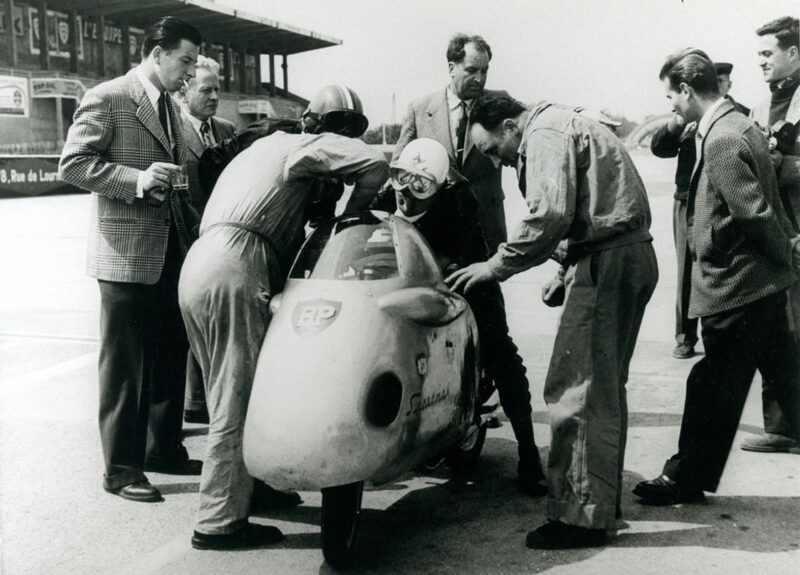 In October 1951 an AJS 7R (rated 34hp @7200rpm) lapped Montlhéry at 183kmh (110mph) without a fairing, taking 16 world records in the hands of British Bill Doran, New Zealander Rod Coleman and French champion Georges Monneret, who was a busy man at that track! 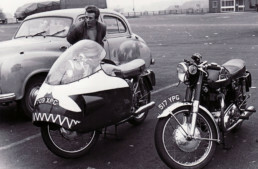 The 7R took a 2-hour record at over 176kmh(105mph), and another 15 world records with a sidecar, from 7 hours to 1000 km. 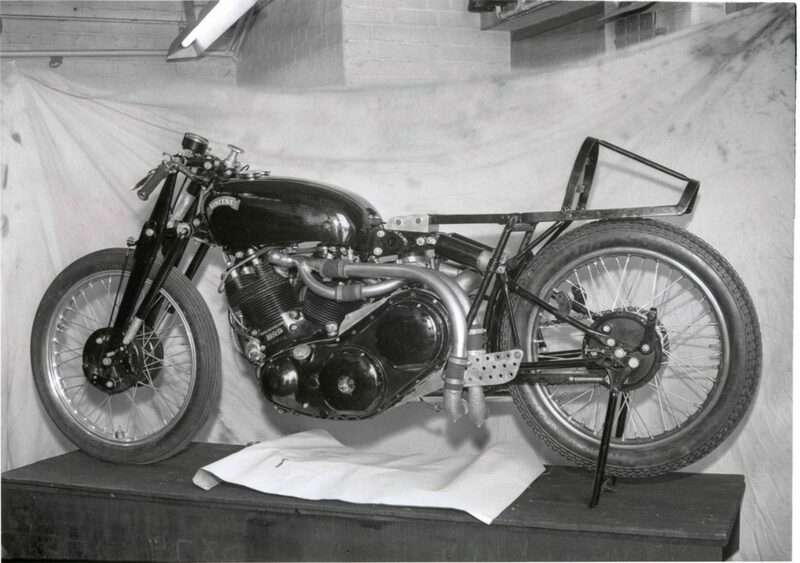 AJS returned to Montlhéry in October 1952 with a brand new three-valve version – the 7R3 – and Pierre Monneret with Bill Doran beat 21 world records including the hour at 186.07 kmh (111mph), that had been held for 14 years by a supercharged 250cc Moto Guzzi. France produced only a few large sidecar haulers after the First World War. The rare exceptions were the 750 and 1000cc René Gillet, and the Gnome & Rhone 750 Type X: the queen of French motorcycles. The first Gnome & Rhone in 1920 was the 400cc ABC built under license, a flat twin that won many competitions before its production was abandoned in favor of simpler and more economical single-cylinder bikes. 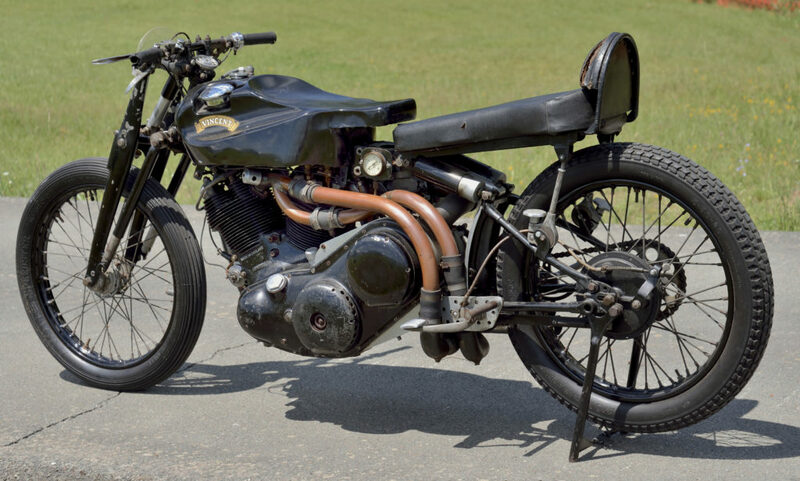 A flat twin reappeared at the 1930 Paris Motorcycle Show with a shaft-drive 500cc, followed in 1932 by the CV2 500, the fastest series of French motorcycles a top speed 130 kmh. For Gnome & Rhône, the only thing missing is the supremacy of a sidecar bike, and the 750 X, presented at the 1935 Show, perfectly fit the role. Its flat-twin OHV motor gave 30hp @5500rpm, with a 4-speed gearbox. This very modern motor was housed in a rigid frame made of stamped sheet metal. 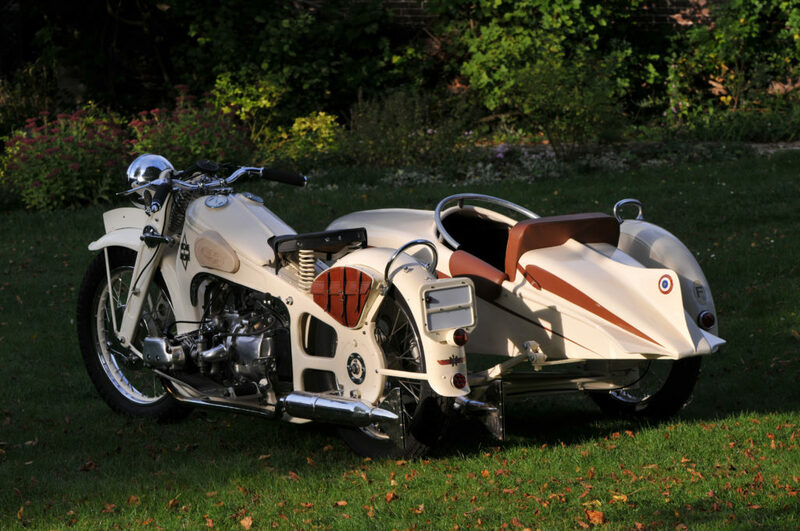 Most often the 750X was hitched to a Bernardet ‘Grand Sport – Avion’ sidecar, with a chassis specially designed for it, the 750X gave a genuine 120 kmh. It also proved its reliability with 20 world records take in June, September and October of 1937, including 24hours at 136.56 kmh (81mph). Two years later at Montlhéry, from April to July 1939, it reaffirms its superiority with 24 new world records, including at 50,000km (30k miles! ), made over nineteen days at a 109.4kmh (66mph) average. Jean Nougier was an engineer who spent his pre-war career upgrading French race machines with advanced overhead-camshaft cylinder heads, and other improvements to make them vastly more competitive. In 1935 he built a 175cc double-overhead-camshaft racer based on a Magnat-Debon, that so impressed the Director of the Magnat-Debon/Terrot factory (Jean Vurpillot), he supplied Nougier with raw castings of magnesium crankcases, and aluminum cylinders and heads. The hot engine of the new 125 DOHC racer built by the Nougier brothers for 1937 looks very much like Magnat-Debon’s 175 LCP from 1935, but everything inside was different: the crankshaft was homemade and the fins of the barrel are square, a rarity at the time. A cascade of gears drives the camshafts. The gearbox is not the new 4-speed Terrot factory item, but a handmade 4-speed gearbox using needle-roller bearings. 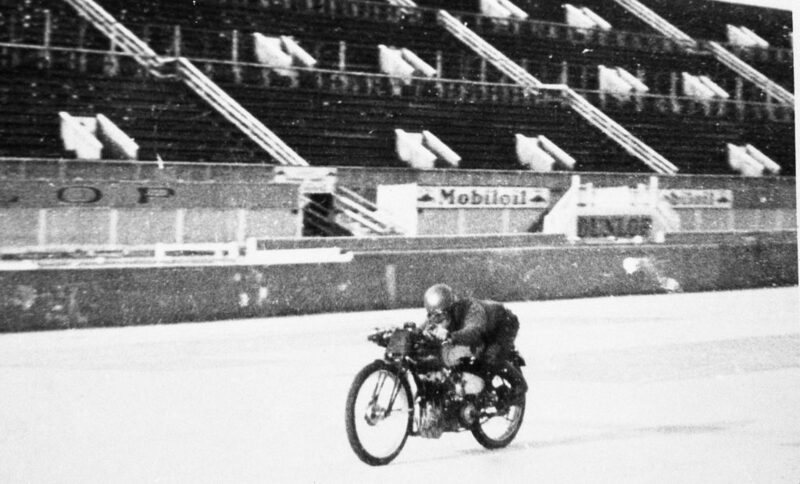 “It worked hard” says Jean Nougier “and took 7800 rpm in the race, and 8500rpm for the records that Henri Nougier beat on May 8, 1938: 50 km, 50 miles, 100 km and the hour, at an average of 114 kmh (68.4mph). 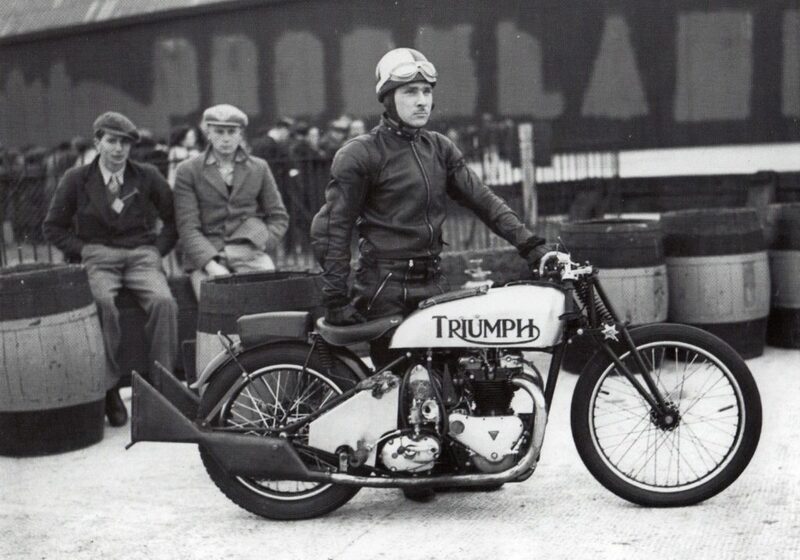 In 1937, Marius Winslow and Ivan Wicksteed took advantage of London’s Earl’s Court Show sensation: the Triumph 500 Speed Twin. But Winslow is a racer, and Wicksteed a tuner: they decided to improve the beast by grafting an Arnott supercharger and a Bowden carburetor with a butterfly valve. Their idea was of course to race at Brooklands, the British counterpart of Montlhery, 4.43km long and located in Weybridge, a suburb of London. On October 8, 1939, they beat the Brooklands lap record with an average of 118.02mph. This record was never beaten, as later in 1939 Brooklands was given over to the Royal Air Force, for it had always included hangars and an airfield in its central expanse. The track emerged from WW2 in ruined condition, and was finally given to Armstrong-Vickers, who razed part of the banking to extend its airfield for jet testing. 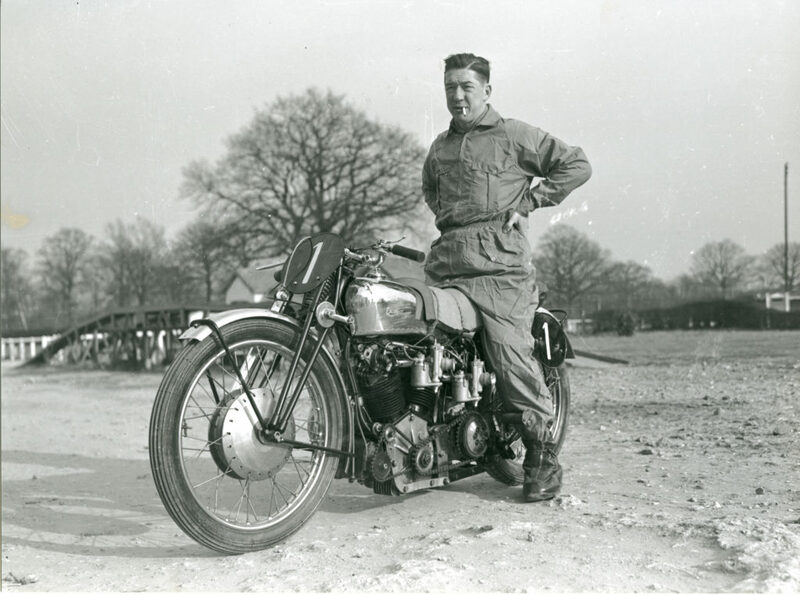 Ivan Wicksteed at Brooklands before his 1939 attempt on the lap record. 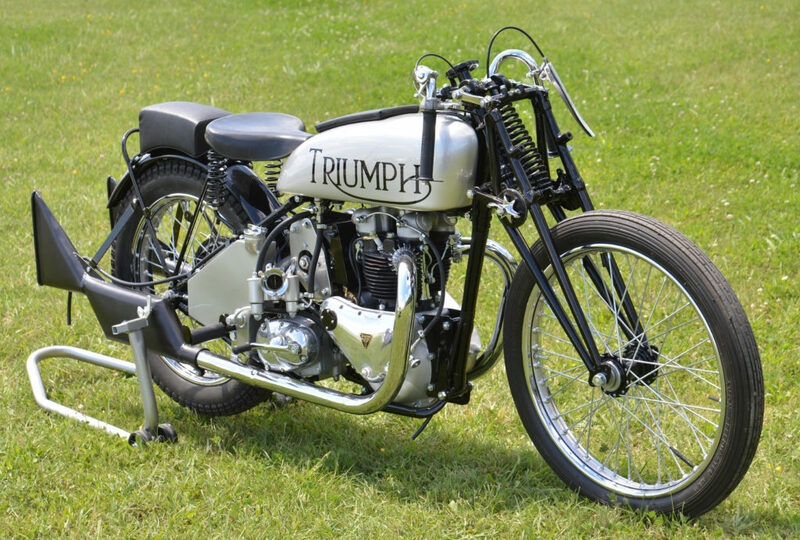 Thus the Ivan Wicksteed supercharged Triumph holds the 500cc Brooklands lap record in perpetuity. 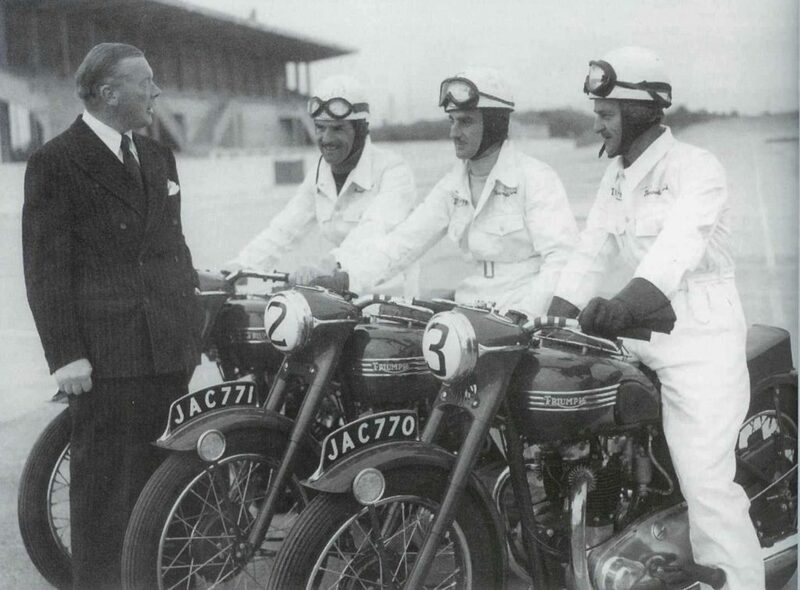 Wicksteed and Winslow, while still in their twenties, had actually approached Edward Turner (Triumph’s Managing Director) for support in supercharging his new Triumph twin, explaining their plans to take the Brooklands record. Turner granted them a brief meeting, heard their plans, and said, “A very logical conclusion. Good afternoon, gentlemen”, then walked away! Of course, when Wicksteed’s Triumph was successful, Turner wasted no time taking out full page ads in the press to congratulate Wicksteed and Winslow, and crow about their lap record. 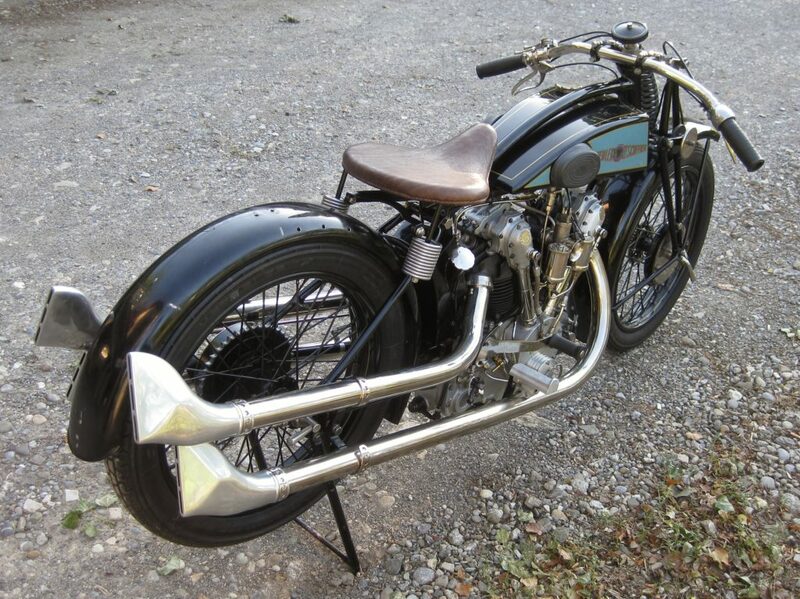 To his credit, Turner then offered whatever factory support they needed, but the closure of the track in later ’39 halted their collaboration…and, we might add, the certain discovery of every weak point in the original Speed Twin engine design! Early in 1949 Ed Turner asked his engineering department (since he was no engineer himself) to enlarge the engine for the 500cc Speed ​​Twin. They came up with a 650cc motor with a longer stroke (to use the same crankcases), but gave an added 7.5 hp. 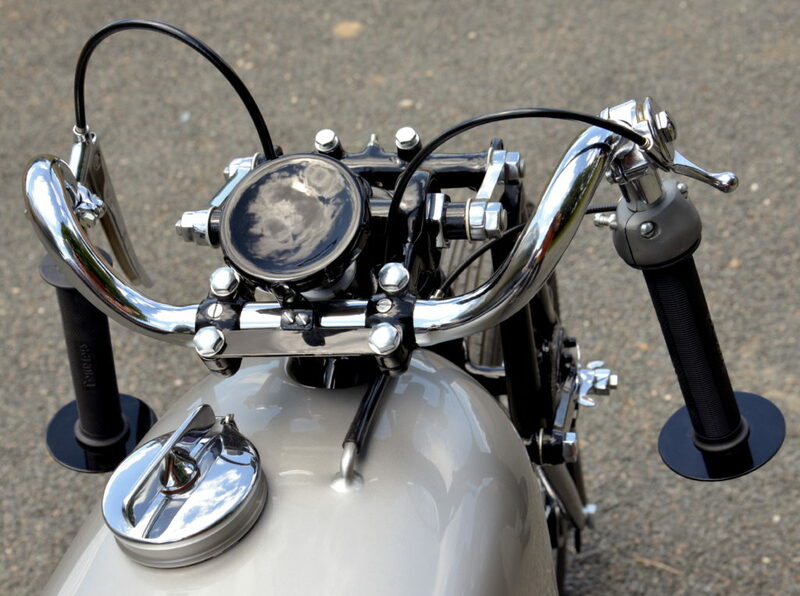 The name of the bike was coined by Turner himself, who also drew the famous tank badge, while pondering the American market, and dreaming of the famous bird from North American Indian mythology. 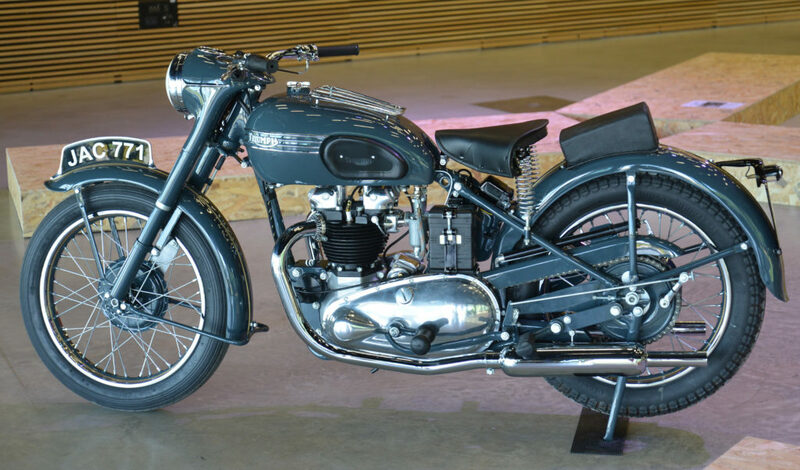 Triumph officially unveiled the Thunderbird on September 16, 1949 announcing that four pre-production models will rally to France by road, and take in some hot laps at Montlhéry. According to the plan, three of the four bikes would cover 500 miles (805 km) at an average speed of 145kmh (85mph) on the Montlhéry ring, before ending up in apotheosis with laps at over 160kmh (96mph). The Thunderbirds fulfilled the plan perfectly, despite the poor quality of gasoline at the time, with 72 octane. This is the craziest of all Vincents, a supercharged Black Lightning specially made for the British racing driver and motorcyclist Reg Dearden, who wanted to break the world speed record, then fixed at 279.3kmh (167.58mph) since 1937 by BMW. The very special factory-built Lightning was ready at the end of 1949, and was returned to the factory in 1950 to receive a Shorrocks supercharger, with the configuration designed by Philip Vincent himself. 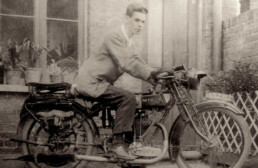 It was the first time Vincent had supercharged one of his motorcycles since the 1930s, when he experimented on both his singles and the V-twin HRDs. The foundation of the Dearden Lightning is identical to Rollie Free’s Bonneville racer, made immortal for his photo stretched over his Lightning in a bathing suit to take the US national record at 241.9kmh (145.94mph) in 1948. Nothing, alas, happened as planned for the Dearden bike. Fueled with alcohol by a single 63mm SU carburetor and the Shorrocks blower mounted behind the gearbox, the Lightning recorded 130hp @6800 rpm. Dearden’s planned attempt on a German autobahn was postponed after NSU snatched the world record at 289.7 kmh (173.82mph) on 12 April 1951 in Germany, then 340.2 kmh (204.12mph) in 1956 on the Bonneville Salt Flats. 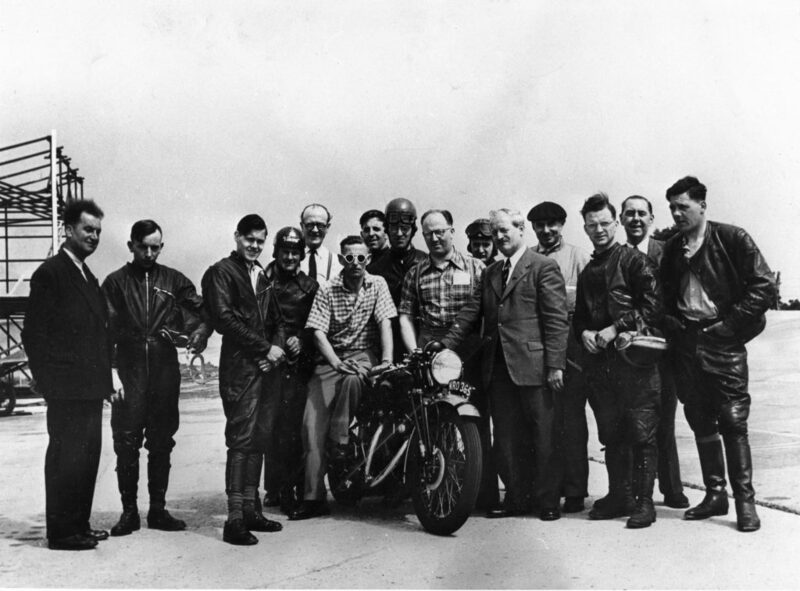 Beating that record was unrealistic, as the Vincent was naked, and their scheduled rider, Leslie Graham (the 1949 world champion) was killed in the 1953 Isle of Man TT. Dearden then planned to install the Vincent into a streamlined ‘cigar’ in the United States, but the airplane he modified specifically for this transport from Britain was de-certified for flight! That was the last straw in what was essentially a private effort. Vincent deserves a place with the record breakers at Montlhéry, as in 1952 a team including Georges Monneret, John, Surtees, and Gustave Lefevre took eight long-distance world records. 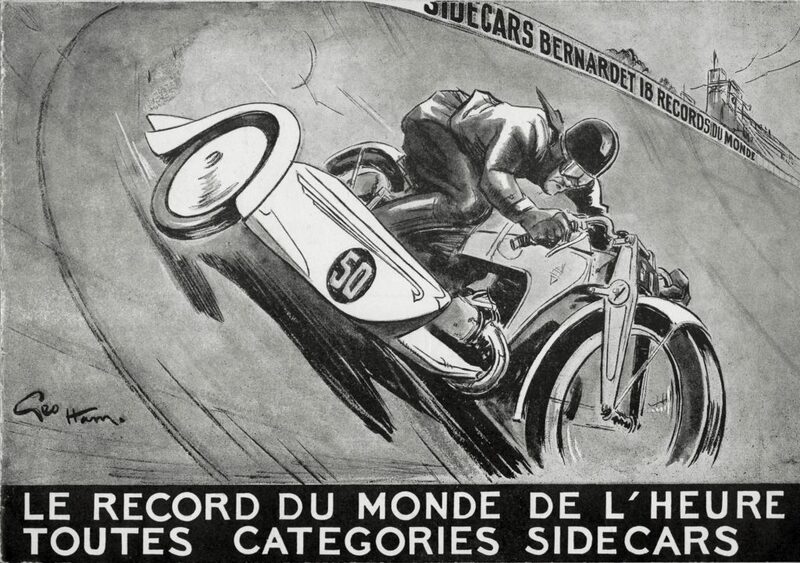 The absolute world speed record for sidecars dates back to the mid-1950s, taken with an unsupercharged BMW twin-cylinder of only 500cc. Is anyone up to tackling it today? 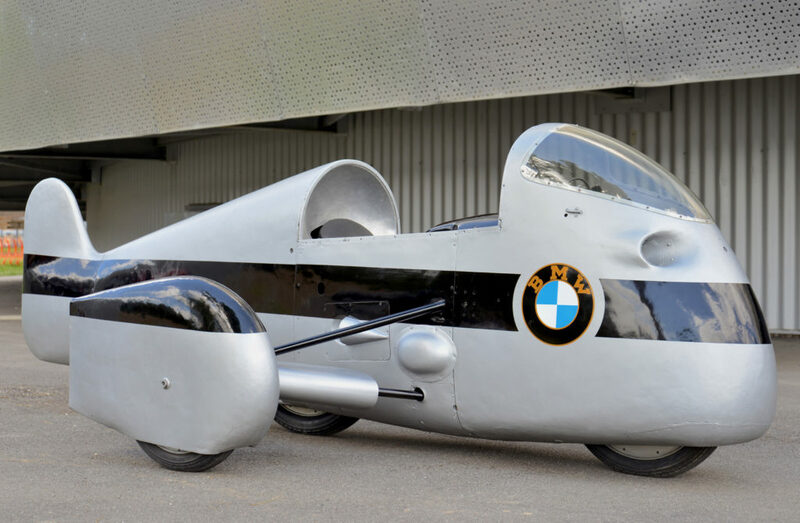 BMW was extremely active in World Speed Records from 1929 to 1937 [as discussed in our post here], and re-entered the fray in 1954 at Montlhéry. 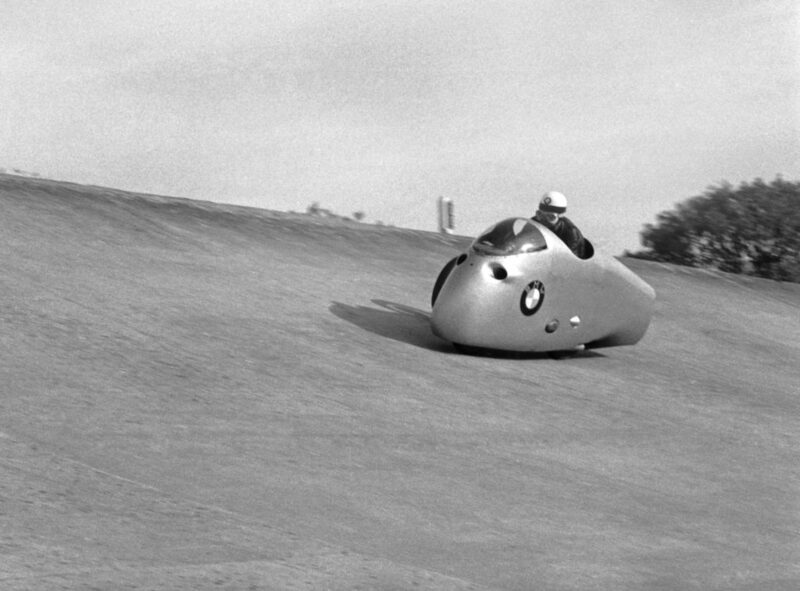 A solo RS54 racer was ridden by Walter Zeller and the brothers Hans and Georg Meier, while a streamliner sidecar was ridden by Wilhelm Noll, Fritz Hillebrand and Walter Schneider. Noll was the world GP sidecar champion that year, ending the supremacy of the Norton/British teams, and the BMW took 18 world records at Montlhéry on October 30 – 31. Their average speeds beat the previous 500, 750 and 1200cc sidecar records for 10, 50 and 100 miles, 50 and 100 km, and various time records. Noll did even better on October 4th, 1955 on the Munich – Ingolstadt autobahn, where he reached 280.155 kmh (168mph). Using a special fuel mix that allowed compression ratios of 12:1 (instead of the usual 10:1). The 500cc flat twin Rennsport gave 72bhp @10,000rpm, using a Bosch fuel pump supplying a pair of 32mm Amal GP carburetors. Of exemplary stability, the RS54 perched on three 19″ wheels weighed only 200kg (440lbs), plus 60kg ballast in the ‘sidecar’. The beautifully streamlined enclosure gave an extremely slippery SCx (drag coefficient) of 0.15 M2, versus 0.28 M2 for an unfaired, solo Rennsport. 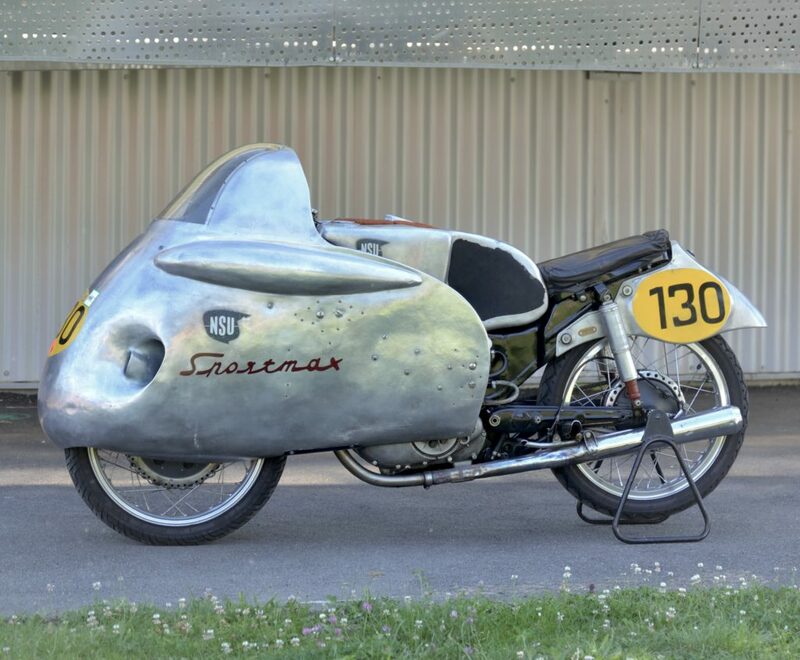 On May 23, 1956, Georges Monneret, the 250cc world record holder, and his son Pierre, piloted this 250cc NSU SportMax factory racer to take eight long distance world records, from 50 to 500kilometers, the latter at a 160.28kmh (96.2mph) average, with a fastest lap at 198kmh (118.8mph), upping the previous lap record at Montlhéry of 190kmh. This SportMax is nearly as per production spec, but is tuned with 30hp @9000rpm: special tires are inflated to 4.3 bars (62psi). 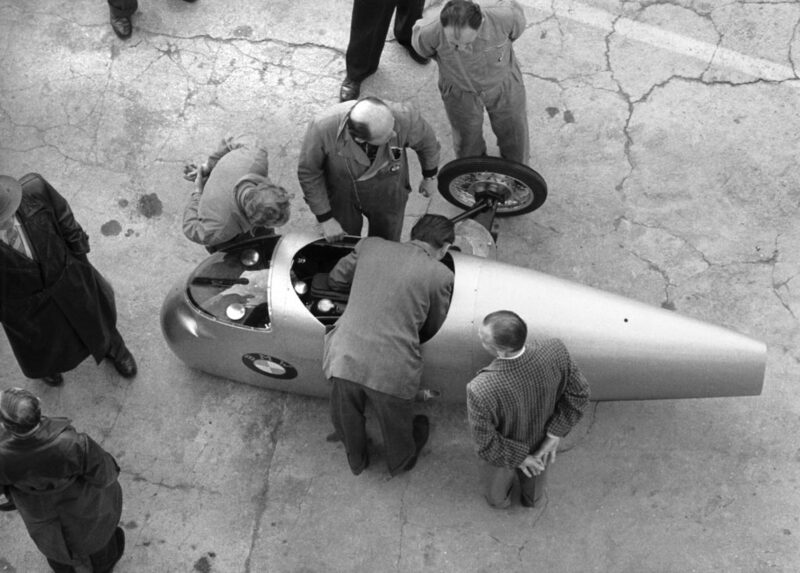 These aren’t the first SuperMax records; a few months earlier, on December 20, 1955, the Swiss rider Florian Camathias teamed with Maurice Bula, hitching an identical NSU to a ‘sidecar’ (actually just an outrigger wheel with a 60kg weight) that took 16 world records from 10 to 1000km at Montlhéry, with laps over 160kmh (96mph), taking 6 hours at a 145.8kmh (87.48mph) average. Monneret’s machine is fueled by a 29mm Amal GP carburetor, but on the outside looks just like the standard 250 SuperMax, except for its large 22-liter aluminum tank and 210mm front brake drum. It weighs only 116kg (255lbs) without its fairing, and reaches 210kmh (126mph) with this very enveloping aluminum fairing. The NSU is peculiar in its valve drive system, with overhead rockers driven by two eccentric rods linked to the crankshaft. The Sportmax remained competitive until 1958, when Mike Hailwood finished 4th in the World Championship riding one!